Picture this: the party is in full swing and you have your iPhone/iPod Touch or iPad hooked up to your favorite speaker system on the other side of the room. The volume is too loud, or you want to change tracks to a different song, but you really don't want to leave that fascinating conversation on the adolescent psychoanalysis of superhero origins. What's a gracious host to do? Just as you undoubtedly have a remote for channel surfing or controlling the volume on your TV, why not a remote for your iTunes playlist? AirTurn features two different remotes for your favorite playlists - the AirTurn DIGIT and the DIGIT II. 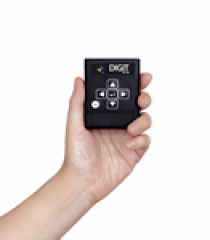 The DIGIT is a handheld remote that also doubles as a hands-free pedal controller. 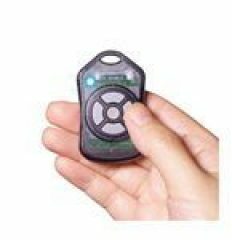 In its handheld incarnation, the DIGIT features 6 silent membrane buttons, giving you control over volume and playlist navigation for Bluetooth-equipped device that can run iTunes. That includes iPhones, iPod Touch, iPads, and even versions of iTunes for Mac and Windows PC computers. When attached to pedals, the DIGIT can be used to trigger a host of other app functions, ranging from basic page turns to triggering camer and video controls for iOS devices. If you don't need the foot pedal option, then you'll want to check out the DIGIT II, the successor to the DIGIT in a much smaller form factor. It's even designed as a fob to latch onto your keychain so you don't have to worry about losing it.